At long last, college football is back. Yes, we realize that tonight’s game may not be the most anticipated of the season (if you’re wondering, the Georgia State Panthers will be taking on the Abilene Christian Wildcats), but we couldn’t be more excited. 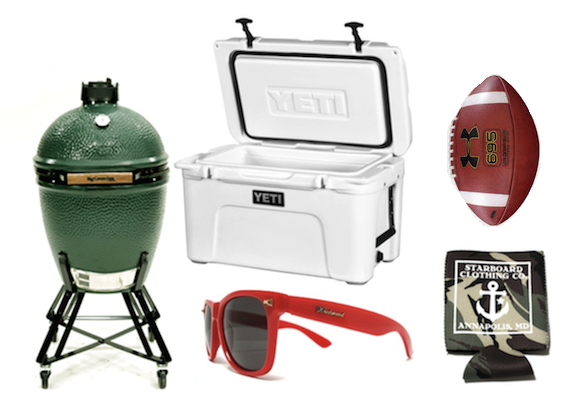 Not only are we excited about the return of college football, we’re also excited about the return of tailgate season. Year in and year out, our tailgate staples seem to remain the same (*this year we did switch from a Nike football to Under Armour), so today we’re revisiting a post that originally ran on September 8, 2012. Okay, we’ll admit it, we are still ridiculously excited that college football is here. So much so that we’re dedicating another Saturday post to some more of our favorite gameday essentials. This week our theme is the event that at times eclipses the game itself, the tailgate. Below you will find a few things that we always love to see when we roll in to any college town bright and early on a Saturday morning. Big Green Egg: Anyone can show up to a tailgate with a your run of the mill charcoal grill, but when you roll in with a Big Green Egg, there will be no doubt that you are about to throw one heck of a party. Yeti Tundra 45: The only way to make sure that the beer will still be cold when you get back to your tailgate spot after the game. UA Gripskin 695 Football: Just because you aren’t suiting up for battle on the field, it never hurts to run a couple of routes to loosen things up. Your favorite koozie: Last week we were using one from our friends at Old Try. This week, it’s the camo version from Starboard Clothing. Whatever your favorite koozie is, don’t leave home without it. Knockaround Sunglasses: Whether you grab a pair of Fort Knocks or Mile Highs, Knockarounds are the perfect choice for gameday. Should things get a bit out of hand, the price tag won’t leave you reeling if they don’t make it home.